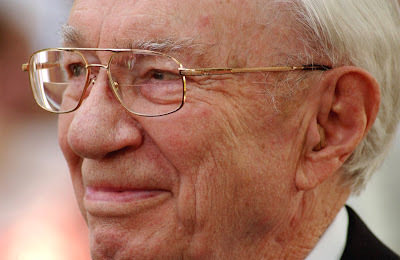 We would like to express our feelings and our testimonies of the recent passing of our Prophet, President Gordon B. Hinckley. As most of you know, he passed way Sunday night. When we heard of this Monday morning it was a shock. Both Tracey and I, as we have made progress in our lives, have had opportunities to listen to his talks and to read his articles, and see what a great example this man was. We both have come to know in our hearts that he truly is a Prophet of God. He has been very inspiring in many ways to us. We are grateful that he was a Prophet that built so many temples through out the world to make it easy for all of those desiring to attend the temple to do so, that includes us. It is a comfort to know that he will be with his wife. He has said on several occasions that he missed her and you could feel the deep devotion that he had to her and their marriage. Which brings us to bear our testimony that we can be together forever, and that should be a comfort to all of us. He was a great exemplar of that principle. He was also a model of love and kindness to others. As you can tell from the picture above, you could always find comfort in his smile. He personified the Saviors example of loving his neighbor. Tracey and I loved him and will miss him very much. For those interested, I have finally completed my first church building. However, I still have a few odd and end little things, and my finally walk through is February 6, 2008. They have been holding services, though, and have already dedicated the building. The church members seem to be really happy with the building from what I've heard. It's been an experience being involved with the Church on the business side. The Church truly expects near perfection. I always considered myself to be a perfectionist, but when you are involved with so many trades, it's hard to make sure that everyone is holding to the standards and specs the Church calls for. All in all, I look forward to the next. Our company is at a slow point now, however, we have other things going on. The Church has many upcoming projects, and my understanding is that they have more buildings budgeted this year than any other year in the past. Which proves to me the Church is truly growing rapidly. We were very excited about the snow. Last Wednesday we got some nice snow showers (which will also help our drought) that were very pretty. You don't see that much down here so we were excited. Then they forecast more snow showers with 1-3 inches of accumulation for yesterday and today and with the "Siberian Express" cold front it would stick, but good. Well, yesterday we were out and about and there was snow and sleet falling. We finally got all of our errands run and got home to settle in and watch it fall and it quit, not to mention that everything that fell already melted and dried up. So we are looking at a lovely day, that is freezing and with no snow. After Wednesday how disappointing is that!?!? We have found ourselves witness to a historic event in Georgia history (I'm sure several of the southern states history as well), the 100 Year Drought. We have gone from the basic dry and every other day watering your lawn to talk of only 90 days left of water and absolute watering bans. We pass by Lake Allatoona every day on our way to work and it is all but gone. At one point the bottom of the lake was so dry that it cracked. People went out into the lake beds with 4 wheelers and metal detectors. The pictures above are some that we have taken recently and this is after some relief with a few small rains. This has really illustrated the prophets' emphasis on being prepared and having food and water storage. Some of the other guys at work have gone out and bought the big water barrels. We went and stocked up on bottled water and 5 gallon jugs of water ourselves. Hopefully this winter will provide enough moisture to get us back up to normal. Well, as of Saturday the 12th it's been fifteen whole years, and where has the time gone? Not that we are old or anything, but 15 years! And I can't speak for Scott, but they have been the best 15 years ever! Not that they haven't been hard sometimes, but at this point in our lives and in our marriage we are happier now than we've ever been. It's wonderful to be married to your best friend. We are having fun and looking forward to 15 more years. I just talked to Scott and he says that they have been the best 15 years for him, too. So it's unanimous. Happy New Year! I guess we are going to give this blog thing another try. It's been a busy 2007. We've enjoyed Atlanta. Scott got Church project finished (pictures will post later). The kids are busy with growing families. The Grand kids are growing fast and are an unlimited source of entertainment! And the holidays, what can you say about that. They were great fun, and very tiring, but great fun! We are looking forward to the new year and all the excitement it will bring. We'll keep you posted, so to speak!